The wide availability of cultured, probiotic-rich (and prebiotic-rich) foods makes it very easy to boost the amount of these beneficial microbes in an average diet. Whole food markets abound, and if there’s not one nearby it’s easier than ever to find acidophilus-enriched yogurts and kefir milk in almost every supermarket. The foundation of any diet begins with a healthy breakfast. Incorporating probiotics into this meal will give your body a digestive boost that will last the whole day through. If you’re trying to increase the amount of probiotics in your daily regimen but have been at a loss as to how to go about it, here’s a tasty breakfast recipe that’s not only simple, but bursting with probiotic goodness. * Place the first six ingredients in a blender and blend until smooth. Depending on the blender, this can take from one to three minutes. * Once the contents have blended completely, add the protein and probiotic powders, using the dosage guidelines on the bottles or canisters. This is especially important if some of the smoothie will be consumed by children, who require smaller amounts of fiber and probiotics than adults do. * Blend again, another minute or so, until the powders are completely incorporated into the shake. Pour into big cups, and enjoy! If you want something with more substance to chew on in the mornings that still gives a probiotic boost, consider adding tempeh. It is easy to cook, takes on the taste of whatever it’s cooked with, and is chock-full of beneficial microorganisms. 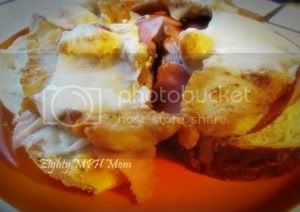 This is a recipe that can be made well ahead of time, then reheated in the microwave for a quick breakfast treat. * Mix the soy sauce, liquid smoke, maple flavoring and black pepper in a shallow dish, then place the tempeh in the mixture to marinate for twenty minutes. * Heat the oil in a large frying pan over medium heat. * Remove tempeh from marinade, pat dry with paper towels, carefully placing it in the hot oil. Fry until golden brown on both sides. Drain on more paper towels. * Place leftovers in a resealable bag or other airtight container and store in the refrigerator until used. * OPTION: For a fun treat kids will love, cut the tempeh a bit on the thick side, then insert bamboo skewers into each piece of tempeh before frying for an easy, on-the-go treat. One Response to "Tasty Probiotic Breakfast Recipes!"